Territorial diagnostic report of the land resources of Somaliland gives an inventory of the natural resources and a territorial diagnostic report. The focus of the report on providing support to land policy development process. This practical guide for land degradation monitoring will provide tools that can be used to facilitate a simple and systematic approach to monitoring long-term changes in soil and rangeland conditions and will be the working document for future monitoring programmes. This study serves as a starting point towards a monitoring initiative for the mangrove ecosystem of Somalia. It also forms part of the input to the land degradation monitoring activity initiated by SWALIM. This study serves as a starting point towards a monitoring initiative for the Golis mountain forest. It forms part of the input to the land degradation monitoring activity initiated by SWALIM. Irrigated agricultural areas of Puntland were mapped using Google Earth images and field based interviews with the farmers to characterize land use. Soil erosion is a complex dynamic process by which the productive soil surface is detached, transported, and accumulated at a distant place. This report outlines how very high resolution satellite imagery was used to estimate the rate of tree-cutting in Puntland. The study used visual interpretation of Ikonos and Quickbird images for 2001 and 2006 respectively to generate tree density maps for the two years. In this study, national-level assessment of land degradation was done using time series remote sensing images from 1982 till 2008 and expert opinion about the history of the degradation in Somalia dating back as far as the experts could remember. During the last 120 years, Somalia and Somaliland have experienced great political and socio-economic changes. The change in land use policies and land use planning activities over those periods is considerable, with new governments often reversing measures taken by previous regimes. This report gives an overview of the land resources for the whole country. The main focus is on the agricultural potential of the country and is expressed through the delineation and description of agro-ecological zones. The conceptual aim of the study is to test and evaluate the applicability of remote sensing tools and products in the assessing pastoral resources. As a useful guide for conservation efforts in land resources management in Somaliland, this report describes the prevalent types of land degradation, their causes and impacts. This comprehensive study involved two levels of assessment. This report describes physical land suitability for rainfed agriculture, irrigated agriculture, extensive grazing (pastoralism) and forestry in the Juba and Shabelle riverine areas. Soil information is a key element for natural resources planning. 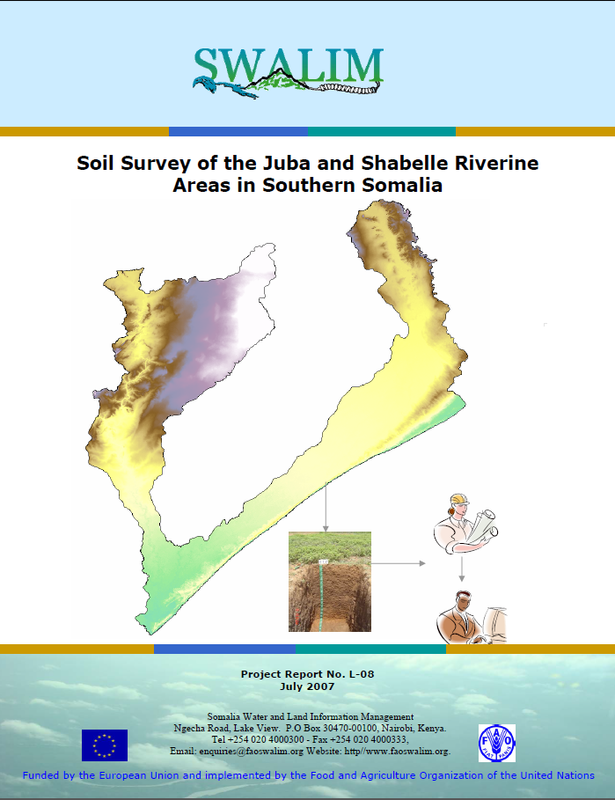 A key output of this study is a soil map with a scale of 1:100, 000 containing the major soil types as well as soil maps for some of the irrigation projects along the Juba and Shabelle river catchments. Land use types in the Juba and Shabelle riverline areas were identifi ed through land cover analysis, interviews with land users and the use of past and current satellite images. The report also shows the characterisation of different land use present in the Juba and Shabelle riverine areas. As an input to guiding policy decisions on land use planning, this study defi nes the capacity of the study area to support specific land use types. The main land use types considered were rainfed agriculture, extensive grazing (pastoralism) and forestry. For this study, land cover classes were created using the Land Cover Classifi cation System (LCSS) of FAO, satellite image interpretation, and fi eld validation. A key outcome of this study is a new landform dataset for the selected areas of interest (AOI). 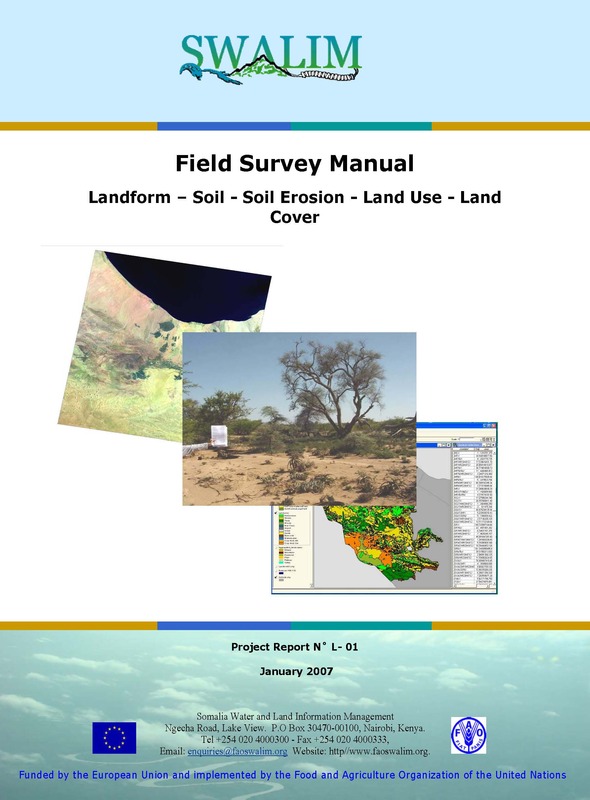 This Field Survey Manual has been produced by the SWALIM (Somalia Water and Land Information Management System) Land Team as a guide to concepts and tools in carrying out field land resource surveys. SWALIM has recovered and produced a vast number of land-related publications touching on areas such as land forms, land cover, land use, soils, land suitability and land degradation among others. These publications can be accessed through our digital library which allows you to browse and search for publications based on specific topical areas of interest, titles and types of publications or names of authors. Below are some of the highlighted SWALIM publications. To search for specific publications, please visit our Library.